John Wingrove enjoyed his trip to Spain earlier in the year so much that he persuaded me that another trip would be a good idea. This time instead of a boat to help John to get around the lake Luis, my Spanish friend chose to use a golf buggy, as we were fishing Embalse de Valdecanas, not too far from Talavera. This lake is really densely packed with barbel and so I knew that if we had some settled weather John would have a good time. The worry was that there might be too much algal growth. Three years ago on a trip to the same lake with Luis, the group that I took all struggled to fish clean water and so very few barbel were caught. 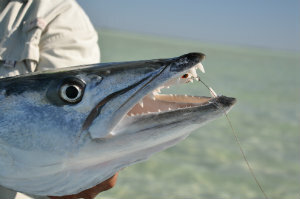 Sure, we saw plenty of fish, but they were mostly dead or dying ones in the margins. 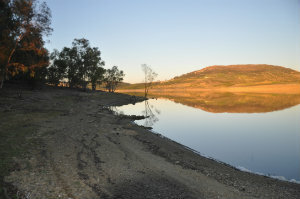 The lake had suffered serious eutrification that year due to the high water temperatures. To be honest we ought not have been fishing, but you know what we are like when we plan for these trips for so many months! Anyway, the buggy was great and the weather didn’t let us down too much. We had pretty thick fog and cool mornings for the first few days, but afternoons warmed up and the barbel came into the shallows. Even when foggy there were just about enough fish in close to keep us interested. The ant pattern again proved to be the best fly – I was tempted to try a buzzer pattern as there were some great hatches in the warm afternoons. I was fairly sure that the barbel were rising to these flies as they hatched. 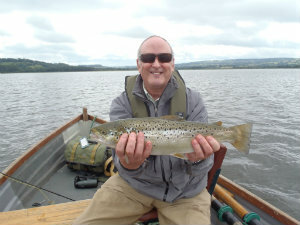 Unfortunately I had not taken my usual fly box and I certainly had no seal’s fur to tie some! All I took was foam and materials for tying ants and beetles! Next time I ought to give the “Bits” a try! John fished really hard for the first two days and, I believe, he caught six or seven the first day and ten or eleven the second. The plan was for him to take the third day off as a rest day. I am glad I made that decision as he slept from the time we arrived at our accommodation on the Tuesday night until breakfast on Thursday morning – apart from getting up for brief meal periods! On John’s day off, Luis took me to the river that feeds the lake. He had found a spot on a farm where he had worked hard to get permission from the farmer to fish. The stretch is only about three to four hundred metres long but it was crawling with fish. However, they were difficult to approach as there was the most incredibly crunch gravel to try to walk across. One false step and you would see a huge bow-wave head up the river as the great shoals of barbel disappeared! I eventually worked out that crawling on all fours was the way to get close enough and soon I was able to cover some barbel. The river fish are really much more difficult to get to take the fly as they seem to be feeding intently on small creatures in the gravel. 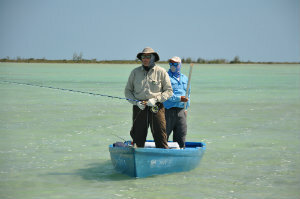 Tailing fish could be seen across the shallows on the whole stretch. 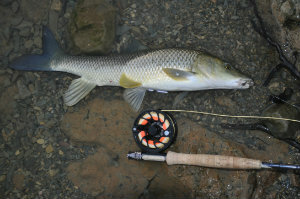 I had my first river barbel on a dry fly after about two hours of fishing and was really disappointed with its fight. That, however was the only one that did disappoint. 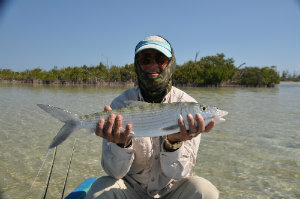 I took six more fish and they were really close to bonefish in their fighting ability! And such beautiful fish too! All were in pristine condition. They were plump, as I have said, hard fighting and beautiful! I must try to find some more places to fish for these Spanish barbel in rivers! Back to the lake for the final two days and plenty more fish for John. Strangely, he would fish in one spot all day, and the fish came to him. In all of my trips I have found that rarely happens! In fact I would say that I find the opposite, in that the further that you are prepared to walk, the more chance I believe that you have to catch a fish! I am inclined to suggest that you are rewarded for the distance that you travel! John seemed to disprove that theory, but then Valdecanas does have a very big population of barbel compared with other lakes. I hope to get back to Spain in 2016, but if any clients or readers of this want some information about the fishing please drop me an email. It really is good fun and quite possible to do on a family holiday. 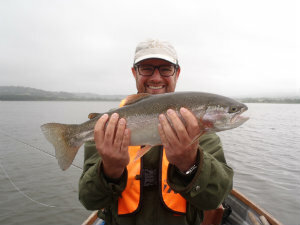 Luis runs trips for anglers from all round the world, but I warn you he is not cheap. He does provide first rate accommodation. The system of “Rural Houses” in Spain is really excellent. I have yet to stay in one that is not fantastic! And, most trips that you might want to do for barbel are in the less busy tourist times of the year. A word of warning. 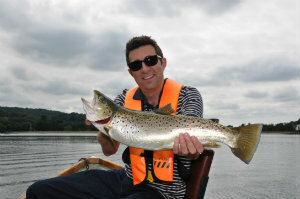 Don’t think about fishing for barbel in June, July or August as it really is too hot. Spring or autumn are fine, and even in winter you will find fish feeding if the day is warm.